Reading and share top 4 famous quotes and sayings about Bonds Of Friendship by famous authors and people. Browse top 4 famous quotes and sayings about Bonds Of Friendship by most favorite authors. 1. "Here's a news flash: No soldier gives his life. That's not the way it works. 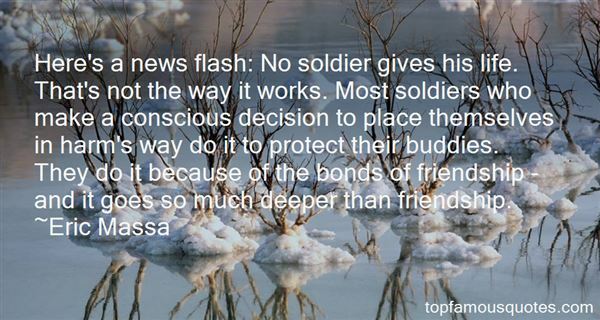 Most soldiers who make a conscious decision to place themselves in harm's way do it to protect their buddies. They do it because of the bonds of friendship - and it goes so much deeper than friendship." 2. "The bonds between ourselves and another person exists only in our minds. 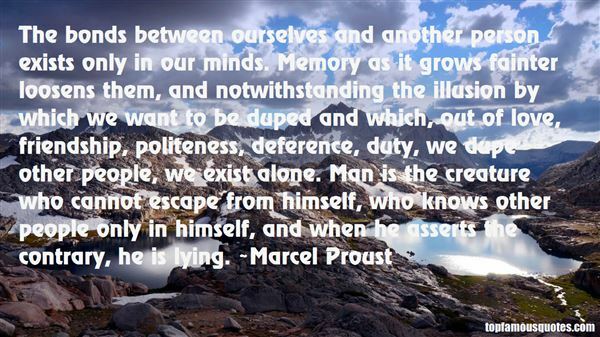 Memory as it grows fainter loosens them, and notwithstanding the illusion by which we want to be duped and which, out of love, friendship, politeness, deference, duty, we dupe other people, we exist alone. Man is the creature who cannot escape from himself, who knows other people only in himself, and when he asserts the contrary, he is lying." 3. 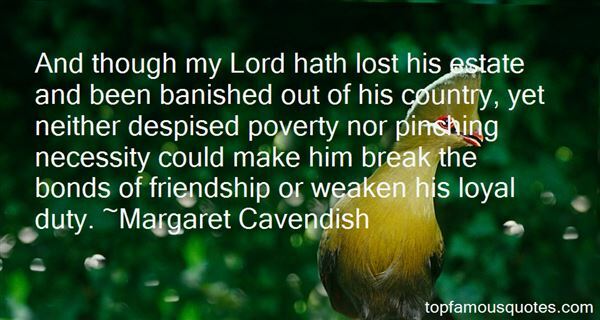 "And though my Lord hath lost his estate and been banished out of his country, yet neither despised poverty nor pinching necessity could make him break the bonds of friendship or weaken his loyal duty." 4. "The bonds of friendship dwindle with age, Oliver. But a little blackmail lasts forever." What's right? If you want something, you have the right to take it. If you want to do something, you have the right to do it."